Who are you and how do you contribute to creating a more sustainable world? 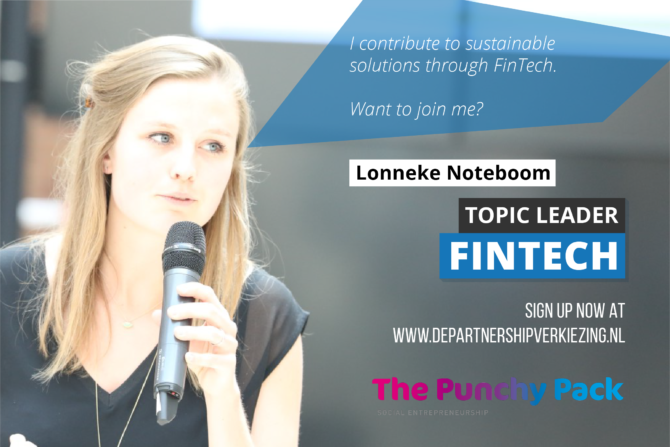 My name is Lonneke Noteboom, and I am a Fintech specialist at FMO, the Dutch Development Bank. FMO, a leading impact investor, supports sustainable private sector growth in developing countries and emerging markets by investing in ambitious projects and entrepreneurs. Fintech can help FMO achieve its goals since it is a key driver for financial inclusion. I am part of a dedicated Fintech team that works on the two sides of the Fintech spectrum: on the one hand we work with innovative Fintech entrepreneurs that have inclusive business models, and on the other hand we support FMO’s existing clients – being the more traditional financial institutions – leverage Fintech solutions to make their services more affordable and accessible. By being a topic leader, I aim to show how technological innovations in emerging markets, mainly powered by mobile phones and access to data, are fostering financial inclusion. Through my work at FMO, I can contribute to a more sustainable world by supporting these innovative solutions on a daily basis. According to you, how should the world of FinTech look like by 2030? Let me start by saying that technological change is happening so fast that it’s difficult to picture the world by 2030. What I can sketch though, is an ideal world where FinTech is used as a tool to connect all underserved segments of the population to financial services. FinTech can help to put these underserved segments, by which I mean small businesses (SMEs), female entrepreneurs and smallholder farmers across emerging markets, at the centre of attention where products and services match exactly what the customer wants: a reliable, enjoyable, easy to use and accessible service. Envision it like a comfortable blanket that shapes itself around each individual customer. FinTech will be so immersed into our lives that we won’t even notice we are using it, nor do we associate FinTech with just finance anymore. A wealth of products and services, cutting across the energy, agriculture and financial sector are available at the exact time and place the customer needs it. Let’s imagine you’re standing on a stage in front of 1000 organisations that all believe in the future of FinTech. What trends would you tell them to, urgently, pursue to bring us closer to this ideal world? I would stress the importance and power of platforms, which is a trend we can already see happening in the financial sector. Platforms can make a variety of products and services easily available to customers, tailored to their specific needs. Picture it as shopping in your very own financial supermarket; a one-stop shop where each individual walks through the supermarket at a different pace, looking for different products. A farmer in Kenya, for example, can access micro-insurance, purchase his inputs, and obtain a loan that matches his specific crop cycle. At that same platform, a small business owner can manage his invoices, obtain accounting advice, and get working capital to fill up his stock. Since personalised advice and –products can only be given based on an extensive analysis of customer data, organisations should carefully construct a safe, responsible and respectful way of treating their clients’ data. What’s more, organisations moving towards a platform model need to think about how to extend their operating ecosystem to strengthen the engagement with the customer. Partnerships are crucial here since there’s no need to re-invent the wheel. Make use of those specialised in micro-insurance, if we continue on the smallholder farmer example, rather than building that product yourself. How do organisations currently utilise these trends? There are some organisations taking steps towards this direction. To serve SME customers in Europe, ING partnered with a FinTech company called Kabbage. Where Kabbage brought their innovative credit scoring algorithms to the partnership, ING brought in its existing relationships with prospective SMEs and its pool of capital. Through that partnership, ING is now able to make loan decisions for SMEs in just a few minutes. If we look outside of Europe and more towards the emerging markets where FMO operates, financial institutions in countries like Kenya, Ghana, Nigeria, Tanzania and Malawi are working with us to integrate FinTech solutions. Last year, FMO launched FinForward, our flagship FinTech innovation and integration program. FinForward empowers African-based financial institutions to connect with FinTech companies worldwide. The partnerships that can result from FinForward enable financial institutions to roll out new products and services and reach more customers. For example, we are connecting them to companies that use satellite data to accelerate the development of fair financial products and services for farmers. What role can large commercial organisations have in FinTech? Large commercial organisations such as Unilever, Ahold-Delhaize and Tony’s have a large role to play in FinTech. I see many opportunities for technological innovation in the value chains they operate in and believe that the adoption of (Fin)Tech can be a springboard to sustainability. A Dutch coffee production company, for example, uses blockchain technology to increase transparency in their Ethiopian coffee value chain. As a result, coffee consumers can see exactly how much a local coffee producer receives for the beans he sold. What’s more, this company set up local coffee roasting facilities to ensure that value-adding activities will actually benefit Ethiopian farmers and the broader economy. I think that programs such as the Punchy Pack are very valuable since it encourages young professionals of large commercial organisations to think about sustainability in a creative manner. It’s great to see that they get the time and space to come up with solutions that will innovate the organisation from within in a sustainable manner.